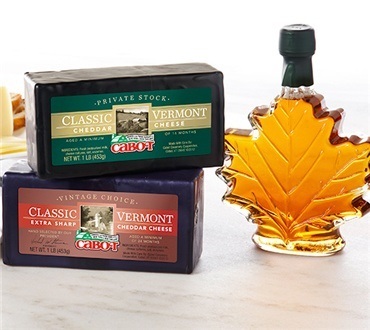 Two of Cabot's finest hand-waxed cheddars combined with Vermont Maple Syrup make the Maple Leaf the perfect holiday gift. This unique gift includes one pound of rich, full-bodied Vintage Choice, one pound of velvety smooth Private Stock, and one beautiful glass maple leaf (8 oz.) filled with pure Vermont Maple Syrup. It's a wonderful gift from our farmer owners to your family and friends!